The Philippines is awarded the Destination of the Year at the 25th Annual TTG Travel Awards 2014, just a few months before the Department of Tourism (DOT) gets set to raise the country’s international profile with its Visit the Philippines Year 2015 campaign. Organized annually by the giant TTG Asia Media’s Travel Trade Publishing group, the TTG Travel Awards has been recognizing the best of Asia-Pacific’s travel trade since 1989. The prestigious travel industry event marks an important time for the industry to recognize the exemplary organizations that raise the bar of excellence. The exclusive event honors stellar organizations and individuals in 4 categories: Travel Supplier, Travel Agency, Outstanding Achievement, and Travel Hall of Fame. Tourism Secretary Ramon R. Jimenez Jr accepted the award before Asia’s tourism professionals at the Awarding Ceremony and Gala Dinner held on 2 October 2014 at the Centara Grand and Bangkok Convention Center in Thailand. The Philippines was chosen as the region’s most outstanding destination in 2014 for distinguishing itself with its proactive steps and initiatives towards the development and promotion of the travel industry. The Destination of the Year falls under the Outstanding Achievement Awards. Other categories include Travel Personality of the Year, Best Travel Entrepreneur, Best Marketing and Relationship Effort, and Best Trade Supporter. The winners are determined by TTG’s editorial team. “We would like to thank TTG for the invaluable support extended to our organization in our marketing and information dissemination efforts. As a trusted travel trade publication, it has been a formidable partner throughout these years in bringing the Philippines closer to our markets,” DOT Secretary Ramon R. Jimenez, Jr. said. 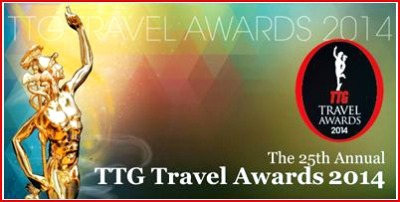 The TTG Travel Awards is now reputed as the most coveted and influential awards to be garnered in the region’s travel industry. The signature trophy, a statuette of Hermes (the god of travel and protector of travellers in ancient Greek mythology), is cast in solid pewter and plated in 24K gold. Weighing two kilograms, the Hermes trophy has since then been the icon of the annual awards. “This award belongs to all Filipinos. It is the Filipino people that have ensured the acceptance of It’s More Fun in the Philippines as a true and accurate description of the participative and active role every Filipino plays in ensuring a successful and enjoyable visit to the Philippines. Again, the determination of the Filipino people, coupled with the support of our President, Benigno S. Aquino III, is our inspiration to build a brighter tourism future for the Philippines—an industry that is more profitable and more inclusive,” Secretary Jimenez concluded. The DOT is gearing up its efforts to promote Visit the Philippines Year (VPY) 2015 - an invitation for all to experience the enduring promise of more fun in the Philippines. Encouraging nationwide participation, DOT aims to stamp passports of 10 million visitors to the Philippines as the country hosts major events such as the Papal Visit in January and the Asia Pacific Economic Cooperation (APEC) Ministerial Meetings and Leaders’ Summit.